Welcome to Springtime! While the warmer weather is always enjoyable, the downside here in the Lowcountry is the coming of a thick layer of yellow pollen across all exterior surfaces. That is why on this update I thought I would deviate a bit from my typical procedural-based emails to instead discuss an important element for the upkeep of your home: pressure washing. We do recommend pressure washing at least once a year. As noted, the dirt and pollen will quickly accumulate on homes and in our humid environment, things will begin to grow on that. We recommend holding off until late spring (May-ish) to do the work, just so that you can wash off the very vast majority of the pollen. Some homes—particularly those on the water—may find that twice a year service is necessary to keep the home pristine, but by and large once-a-year is certainly sufficient. Look for a firm that specializes in pressure washing. Good equipment can be expensive and employee turnover is high, which is why even good trades one year can do a poor job the next. Recent referrals are key to ensuring you get a good job each time. Regardless, please make sure that they have liability insurance and workers comp. You simply never know what may happen, but they are working with water and ladders, so best be careful to protect yourself in case they do not do as good a job protecting themselves on your property. Be sure that the firm takes care to cover doors, light fixtures and ceiling fans. Also, ask them to pre-rinse the plants with just water from the outset in order to further dilute the bleach that may land on them and prevent it from sticking. They should also cover any very delicate plants and flowers to prevent even that much bleach from disturbing them. On that note, while some bleach is necessary to clean the house, it should be a very low solution of it. Some firms end up using a higher concentration of bleach in order to finish faster, but this can ultimately do damage to the paint as well as the plants and the environment. While more labor intensive (and thus more expensive), having someone who takes the time to do it right is important. There are many facets on pressure washing and we have all encountered both good and bad jobs by seemingly professional companies. Again, that’s why we recommend recent referrals. I see the Next Door Palmetto Bluff board as well, so I know many of your neighbors feel the same way. Still, the results are a beautiful home that will last for generations to come provided it is taken care of well. One last note before I completely get away from home maintenance. For those of you who do not already do so, I would like to recommend an HVAC service contract with one of the local heating and air companies. The relatively small cost for the annual contract is minimal compared to the aggravation and higher costs that typically arise when systems are not properly maintained. The peace of mind and prolonged life of your HVAC system are just two of the many reasons why an annual maintenance contract is a worthwhile investment in your home. While I am getting away from “The Process” in this newsletter, I did not wish to completely forsake one element that several of you have commented on: the Employee Introductions. Putting a face with a name and a voice has really helped folks to know who is around the Bluff. In this installment, I though I would concentrate on one superintendent whom many of you know, as he has been with me almost from the beginning: John Birkhead. John was the second person I hired when we moved the operations to Palmetto Bluff (as covered last year, Chris White has been with me for twenty years while Wayne was still wrapping up things in Savannah at that point). Since May 2010, John has tackled some of our biggest projects and done so with an attention to detail and skill in scheduling/organization that rivals anyone I have ever worked with. With all of his experience, John has also taken on an important role in mentoring the new superintendents and especially the assistant superintendents to ensure that they emulate his best practices on sequencing and problem-solving. John made the right call when he decided to move South to attend Clemson and I certainly did when I snagged him early on to be a leading part of our team. I do hope you are doing well and enjoy this wonderful time of year. Originally from England, John was raised in Connecticut until he discovered the campus of Clemson University, which drew him to South Carolina. 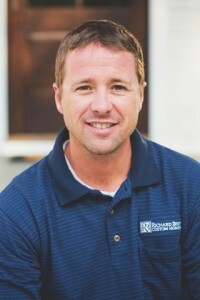 After graduating in 2001, John began his career in construction, and began working with Richard Best Custom Homes in 2010 as a Project Superintendent. His 15 year experience, knowledge and attention to detail makes him a valuable member of the RBCH team. John lives in Beaufort with his beautiful daughter, Kate. In his free time, he enjoys fishing, boating and is an avid runner.